Stainless steel construction for clean or harsh environments. 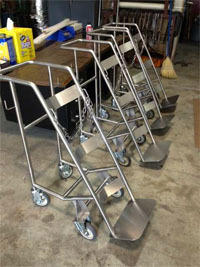 Easily move cylinders around the workplace with the stainless steel cylinder cart. The operator simply pushes the cylinder forward slightly, then pushes the stainless steel bottle trolley to the cylinder. This is done very easily because the stainless steel bottle cart has two small front wheels that allow the trolley to move forward even when the stainless steel cylinder hand truck is vertical. The operator then pulls back on the cylinder until the stainless steel large cylinder dolly is on all 4 wheels. The effort required to do this is minimal. The operator can then fix the safety chain around the cylinder (in the stainless steel cylinder trolley). 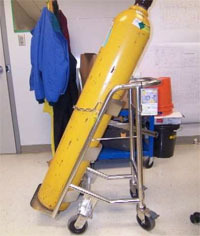 The trolley can then be wheeled around. The operator does not have to support the load at all. 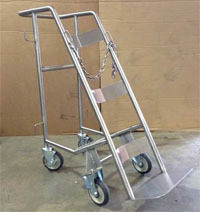 If the operator wants to climb a curb with the stainless steel bottle trolley they simply push back on the handles to raise the front wheels. The Stainless Steel Cylinder Trolley is also referred to as: Stainless Steel Cylinder Cart, Stainless Steel Bottle Trolley, Stainless Steel Gas Cylinder Hand Truck and Stainless Steel Large Cylinder Dolly.